Amir al-Mu’minin (the commander of the faithful), Ali ibn Abi Talib’s (PBUH) characteristics are so many to be contained in a detailed book, so we choose and represent twelve of them; hoping that Shias and his followers exalt themselves and be thankful to the Generous Lord because of having such an inimitable master. The reward of visiting Imam Ali (PBUH) during his life time and after his demise, is more than visiting other Imams. Because he, as the father and the first heir, is the other Imams’ instructor; hence, he who goes on a pilgrimage to his Shrine will collect rewards of other Imams and their Shias’ deeds. It is quoted that Imam Ali (PBUH) that he said: “If a throne [of governance and judgment] is placed for me to sit there and judge people, I can judge among the followers of the Torah according to the Torah, among the followers of the Bible according to the Bible, among the followers of Zabur according to the Zabur, and among the followers of Furqan (the other name of The Quran) according to the Quran. Radd al-Shams is a rare and supernatural event, that only has happened to Amir al-Mu’minin Ali (PBUH) and it means that the sun moved backward in its direction. This event happened to Imam Ali (PBUH) twice. Once when the Prophet (PBUH) was alive and once during Imam Ali’s (PBUH) voyage to Babel after the demise of the Prophet (PBUH). Imam Sadiq (PBUH) quotes from his holy fathers: “‘Abbas ibn ‘Abd al-Muttalib (Imam Ali’s (PBUH) uncle) and Nufel ibn Qa’anab were sitting in front of the Kaaba while Fatima bint Assad came and stood there and her pains of childbirth started and she prayed. Special and exclusive quotes by the Prophet like the Hadith of Al-Manzila (“You are to me like Aaron to Moses, except that there will be no prophet after me.”) and the gate of knowledge (I am the city of knowledge and Ali is its gate.) have been revealed only about Imam Ali (PBUH). All Shia and Sunni narrators have consensus that the first male person who believed in Prophet Muhammad (PBUH) is Imam Ali (PBUH). 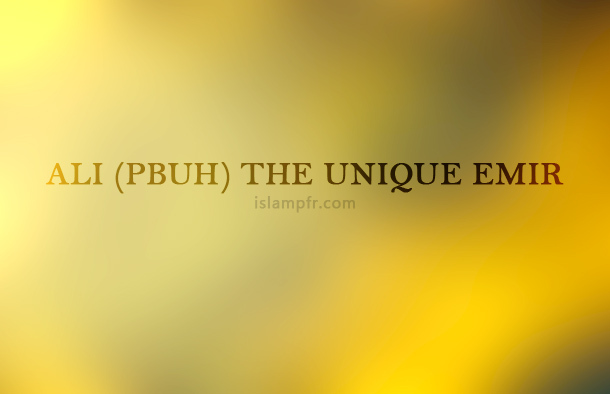 (For further study see: “Ali (PBUH) the first Muslim”). i) The only person who slept in Prophet Muhammad’s (PBUH) bed.